As my shop (Pink Loves Brown) has grown, so too has my need for more storage. The library’s alcove is right outside of my studio, so it’s a perfect place to store some of my inventory and supplies. The alcove used to be more pared down and it looked nice, but it didn’t really serve any function. I put four bookshelves with doors together in an ‘L’ shape, and it’s a much better use of space. The unit in the corner is only half-accessible, but it’s working out just fine. The knobs on the doors were from Anthropologie. I bought them when we moved in for my closet before we decided to use sliding doors, but they were so pretty that I decided keep them. I had never found the right spot for them until now. Also, note that I finally found an Orla Kiely pitcher (that I’m using as a vase) in green! I thought it was going to be yellow from the photos I had seen, but the green is nice. 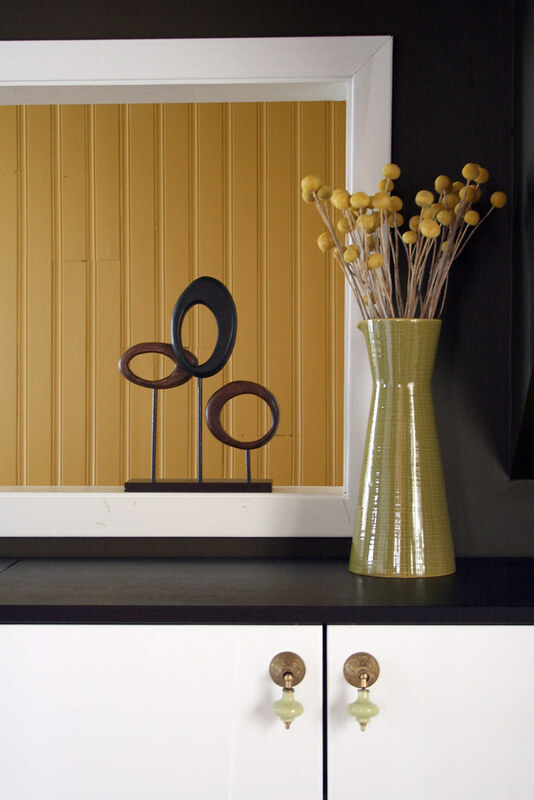 And because I know someone will ask if I don’t source them… Those are dried billy buttons in the vase. I bought two big bunches a while back, and they’re always showing up in various spots all around the house. Next Post Porch and Patio Seating? More pictures! More pictures! Is that black paint? So chic! Where did you get the lovely black lamp? I just love that space! I really like this, what a fabulous idea! This looks really great! I love all your contrasting colors, and how they all tie in nicely. Like a well put-together outfit! Not too matchy-matchy, but just enough to look cohesive. Great! wow, i am always impressed. those knobs really dress up the ikea bookcases, at first glance you would never guess that they are from ikea. Looks great! And that Orla Kiely pitcher is actually a lot larger than I imagined from the photos. Very nice. very very nice…the vase…the knobs..and the flowers reeeeally are great little details that bring the space together…very very nice..
What color is that on your walls? I just love the clean and classic look, and also the color on your walls. And where did you get the very cool circle/ovals on the stand? Oh, I can only hope to be half as resourceful as you. So, so nice–just a perfect use of the space. Bravo. Looks great. Hey any tips on taking pictures of your house? You really seem to get the lighting and the colors right – it seems so rich. I just have to know where you got the pillow and that white square stand decoration next to the lamp? Love the pictures. Did you buy the effektiv storage combination with doors and just swap the doors out with the white ones? I don’t see your exact combo on Ikea’s website. Looks amazing! You’re going to kill me (because I always ask you for paint colors) but do you mind sharing what paint that is? I ADORE it. Are the doors high-gloss white? or just white? Everything looks lovely! Someone asked about the circles/ovals already, but I would like to chime in and ask also about the white square decoration by your lamp. They are the same sort of style, floating shape on base… I love them! I also think I saw a similar one in your living room. Where do you find these neat things? I haven’t got any questions..
Just want to say that your blog is always so inspiring and happy! BILLY BUTTONS!! Thank you for sourcing these, I’ve been meaning to ask you for ages. And although I’m an avid gardener, I have never heard of these and have no idea where I can find them dried in Canada, but i will. The wall color is a very deep brown: “Afternoon Tea” from Pittsburgh Paints. The lamp was from CB2 years ago (it’s by Robert Abbey), the white wooden decoration next to it was from Target (by Victoria Hagan), and the wooden ovals were from west elm. The bookshelves are black-brown high units, and I bought the high gloss white doors. Everything is purchased separately in the system – you don’t have to buy them in combinations as shown on IKEA’s website. You always make such good use of spaces. Can we do a ctrl+c and ctrl+v into my brain? they are in flower shops now and will be for most of the summer and into the fall. I find the best thing to do is actually buy them fresh and just let them dry in a vase. they really are the best thing going. I really like the dark colour in a small space. Do you find it OK to live with over time? LOVE the knobs, I can see why you kept them. Your house is amazing! You have done a fantastic job. I love how put together and showroom quality it all is. I wish my little bungalow had that much style, but then I would need your style! Wow. A-M-A-Z-I-N-G! I have been following your blog for a while and I just love your home! I love the billy buttons and was wondering how long they last for? You busy next week? I know you’re pregnant and all, but if you’re willing to take a road trip, my home office is halfway to its “after” process. I’d love your help. You in? Awesome. I’ll make you some pie. i love the way you decorate! this is such a beautiful place! Your place is looking lovelier and lovelier each time i pay a visit. Congratulations! OK, I clearly need to make the trek out to the Target in Brooklyn…that vase/pitcher is awesome! U have such a lovely site…found my way here from Cuteable. Thank u for sharing….so much inspiration here ! I must say – I like it better now! Hi!!! I´m fan of your blog, it´s lovely. And your home is so beautiful and stylish omg!!!!! Congratulations for your baby!!! The whole look is fabulous…the door pulls are awesome…great detail. Kudos! I so LOVE those knobs! They look fantastic! sigh …I wish I had seen them in the Anthro near me. I’d have held on to them, too. I love so much your style. it’s so cleen..and perfect!! I love these. How did you finish the bottom if you bought the upper cabinet add ons?